The adverse effects of spraying pesticides to the ecosystem are being widely studied. While the effects of their oral and topical exposure have been reported, especially on carbohydrate metabolism, the effects of inhalational exposure have not been reported. Hence, this study was undertaken to investigate the effects of malathion, a commonly used pesticide, on blood glucose and antioxidant status in rats. In acute study, 8 groups of 6 animals each were exposed to 50% malathion for 5 min. Blood glucose level was estimated for all the rats before exposure and at 5, 10, 20, 30, 60 120, 180 and 240 min after exposure for groups 1 to 8, respectively. Blood glucose increased from the basal level of 88 mg dL-1, reached 131 mg dL-1 in 60 min and attained basal level at 240 min. In sub chronic study, there were two groups of 6 animals each control and test. Test group was exposed to malathion vapours for 5 min every day for 28 days. Glucose level was estimated on days 0, 7, 14, 21 and 28 for both groups. The base line value of 93 mg dL-1 increased to 178 mg dL-1 on day 28 in test group. Test animals also showed weight loss of 9.2% and significant reduction of anti oxidants level compared to control group. Thus acute malathion exposure has caused transient hyperglycemia and sub chronic exposure, progressive hyperglycemia (p<0.05) and weight loss. In conclusion, sub chronic malathion exposure causes progressive hyperglycemia which can be a risk factor for diabetes. It is well known that organophosphate pesticides contribute to environmental pollution causing great public concern (El-Kott and Bin-Meferij, 2008). It is reported by Kiely et al. (2004) and US EPA (2002) that more than 5 billion pounds of pesticides are used annually worldwide. Binukumar and Gill (2011) mentioned that according to WHO estimates, 3 million cases of poisoning and more than 2,50,000 deaths occur due to pesticides every year. The commonly used pesticides are the organophosphates. Among organophosphate pesticides, malathion, diazinon, parathion, dimethoate, acephate and chlorpyrifos are frequently used. Though, these pesticides are generally considered safe and non toxic to humans, recent studies conducted in animals and humans have reported the adverse effects on carbohydrate and lipid metabolism, immune and nervous systems (Hectors et al., 2011; Rezg et al., 2010; Beard et al., 2003). Tos-Luty et al. (2003), in addition all these effects, have shown genotoxic effects in rats. Malathion (O,O-Dimethyl S-(1,2-dicarbethoxyethyl) phosphorodithioate) is one of the most commonly used OP pesticides and it is also the first recognized OP insecticide with high selective toxicity (El-Kott and Bin-Meferij, 2008). Lasram et al. (2009) have reported that malathion induced dyslipidemia might result in insulin resistance and hyperglycemia which might contribute to the increased incidence of diabetes all over the world. Few studies conducted on oral ingestion of OPs have shown increased blood glucose level (hyperglycemia) in animals (Kamath and Rajini, 2007; Rahimi and Abdollahi, 2007; Abdollahi et al., 2004). The cause for hyperglycemia has been attributed to the effect of malathion on the production of free radicals and oxidative damage to pancreas (El-Demerdash, 2011; Datta et al., 2010; Koc et al., 2009; Fulia et al., 2011; Shadnia et al., 2011). Hussein and Abu-Zinadah (2010) also reported that pesticides can cause oxidative damage to mammalian organs. But, Sadeghi-Hashjin et al. (2008) concluded that organophosphates on topical application may reduce excessive blood glucose level without affecting basal glucose level implying that malathion may be beneficial to diabetics and non toxic to normal subjects. Thus oral ingestion appears to be hyperglycemic but topical application euglycemic. The results of these studies have shown contradictory effects and whether the difference in the route of administration results in different plasma levels leading to different metabolic reactions is not known. Moreover, no study has been reported on the effects of inhalational exposure. As inhalation is the most likely mode of occupational exposure, the present study was undertaken to find out the effects of malathion on blood glucose level and anti oxidant status in rats by inhalational exposure. This study may lead to further human studies to find out the association between pesticide exposure and diabetes. Approval: The study protocol was approved by the Institutional Animal Ethics Committee at Chettinad Hospital and Research Institute in its meeting held on 08.02.2011. Chemicals: Liquid Malathion (50%) was purchased from Paramount Fertilizer Limited Chennai. Thiobarbituric acid (TBA), Xanthine Oxidase (XO), Ethylene Diamine Tetra Acetic acid (EDTA), hydrogen peroxide (H2O2), glutathione reductase (GR), 5,5-Dithio-bis-2-Nitrobenzoic Acid (DTNB), 20,70-dichlorofluorescin diacetate were procured from M/s Sigma ChemicalCo. (St. Louis, MO, USA). All the chemicals used were of analytical grade. Animals: Sixty wistar albino rats weighing between 150-250 g were procured from the animal house of Chettinad Hospitals and Research Institute, Kelambakkam, Chennai, India, a registered animal facility with CPCSEA of India. The animal house was well ventilated and the animals had 12±1 h day and night rhythm throughout the experimental period. Experimental procedure: Blood glucose level was estimated using the glucometer (SD CHECK GOLD, Blood Gluco Meter, sensitivity-1 mg dL-1) drawing blood from the tip of tail of all the rats. Method of exposure: Animals were kept individually in transparent acrylic boxes containing air holes. Five mL of 50% liquid malathion was instilled into a cotton ball and kept inside the boxes. The animals were taken out at the end of 5 min. Acute study: Forty eight rats were included for acute study. The animals were kept under fasting for 12 h prior to the study and throughout the procedure. Basal blood glucose level was estimated for all the animals before exposure to malathion vapours. Animals were then divided into 8 groups (6 in each) and each group was exposed once to the vapours of 50% liquid malathion for a period of 5 min Blood glucose level was estimated at 5, 10, 20, 30, 60 120, 180 and 240 min for 1 to 8 groups, respectively. Sub chronic study: Twelve rats were selected and divided into 2 groups, control and test (6 in each). Basal blood glucose level was estimated for all the rats. The test group was exposed to malathion vapours every day for 5 min for 28 days. Blood glucose level was estimated on days 7, 14, 21 and 28 for both the groups. All the animals were sacrificed on the 28th day. The pancreatic tissues were taken for antioxidant estimation. Estimation of antioxidant enzymes: Catalase activity was assayed by monitoring the decomposition of H2O2 at 240 nm as described by Aebi (1984). Superoxide dismutase (SOD) was assayed employing the method of Flohe and Otting (1984). The activity of glutathione reductase was determined by monitoring the oxidation of NADPH in the presence of GSSG and expressed as nmol NADPH oxidized min-1 mg-1 protein by the method of Carlberg and Mannervik (1975). Activity of glutathione peroxidase was determined using the method of Paglia and Valentine (1967). GPx was assayed by Rotruck et al. (1973). Statistical analysis: Data are presented as Mean±SD. One way analysis of variance (ANOVA) followed by LSD was used to compare the means of different groups by using SPSS 7.5 student version. In the present first inhalational study, acute inhalational exposure to malathion resulted in a significant increase in blood glucose level which reached a peak level of 131 mg dL-1 at 60 min (p<0.05) but animals tested 120 and 180 min started showing decreased blood glucose level and finally showed normal level at 240 min (Fig. 1). In sub chronic exposure, there was a sustained increase in blood glucose level, reached a peak of 178 mg dL-1 at the end of 28th day and the difference from the baseline value was 85 mg dL-1, which was found to be significant (p<0.05, Fig. 2). The average increase in blood glucose level after acute inhalation was 43 mg dL-1 (50%) and sub chronic inhalation, 85 mg dL-1 (100%). Abdollahi et al. (2004) have reported that oral administration of malathion resulted in elevated blood glucose level up to 25% in rats and that it is due to alteration in glucose metabolism in skeletal muscle (Pournourmohammadi et al., 2005). Joshi and Rajini (2009) have also reported that oral administration of acephate has resulted in 80% increase in blood glucose level. But in our study inhalational exposure to matathiond has caused upto 100% increase in blood glucose level. This shows that inhalational exposure especially sub chronic, carries a high risk of developing hyperglycemia. In addition it was also observed that there was a gradual reduction in body weight of all the animals after sub chronic exposure. 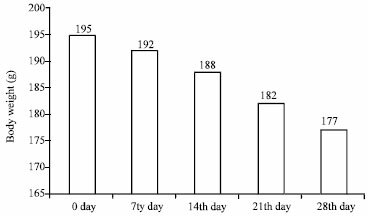 The average bodyweight reduced from 195 g to 177 g in 28 days (loss of 9.2% of body weight) p<0.05 (Fig. 3). The weight loss may due to gluconeogenesis and glycogenolysis in the muscle and adipose tissue. 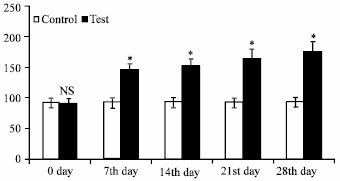 These effects of inhalational exposure have not been reported so far and Abdelgadirand and Adam (2011) have not observed any change in body weight of the rats after feeding with diet containing malathion for 8 weeks. We have also estimated the antioxidants level in the pancreatic tissue. The levels of antioxidants, SOD, CAT, GR, GPx and GSH reduced significantly (p<0.05) (Fig. 4). This indicates the oxidative damage to pancreas which might have led to decreased insulin release and hyperglycemia. Oxidative stress has been implicated to be an important component of the mechanism of toxicity of malathion (Ranjbar et al., 2010; Franco et al., 2009; Durak et al., 2009). It is reported that hyperglycaemia is due to liver glycogenolysis and gluconeogenesis (Rezg et al., 2010, 2007; Joshi and Rajini, 2009). Increased activities of liver Glycogen Phosphorylase (GP) and phosphoenolpyruvate carboxykinase (PEPCK) have been documented which could finally result in hyperglycemia and diabetes (Rahimi and Abdollahi, 2007; Rezg et al., 2006, 2007; Begum and Vijayaraghavan, 1999). Thus multiple mechanisms seem to be involved in the elevation of blood glucose. The transient hyperglycemia caused by acute exposure can be explained by glycogenolysis and gluconeogenesis and the progressive hyperglycemia and weight loss in sub chronic exposure may be due to oxidative stress causing pancreatic damage. As hyperglycemia was transient in acute exposure and progressive in sub chronic exposure, whether recurrent exposure as in field use, would cause a sustained increase in blood glucose in humans has to be evaluated. Fig. 4: Effect of Malathion on antioxidant level in wistar albino rats sub chronic study. Each value is expressed as Mean±SD of six mice in each group. Comparisons are made between groups: *significant at p<0.05. Hyperglycemia and oxidative damage observed in our study are in support of the earlier studies with oral route but in our study the route of exposure is inhalational. The severity of hyperglycemia is found to be greater with inhalational exposure. But it is contradictory to the report of hypoglycemia by Sadeghi-Hashjin et al. (2008) after topical application in mice. Whether the difference in route of administration and species contributes to the difference in response has to be studied further. The loss of bodyweight observed in this study has not been reported so far and is an additional observation. Inhalation of pesticides is an inherent risk not only to the field workers but also others in the environment. Hence, studying the effect of inhalational exposure is mandatory and the present study is the first of its kind to investigate the effect of malathion on blood glucose and its probable mechanism in rats after inhalational exposure. It can be concluded from the results of the present study that acute inhalational exposure of malathion caused transient hyperglycemia and sub chronic exposure resulted in progressive hyperglycemia which could be due to the oxidative damage to pancreas as evidenced by the altered antioxidant status. In addition sub chronic exposure has also caused loss of body weight of the animals. Malathion exposure thus may contribute as one of the environmental factors to the current increased global incidence of diabetes. We thankfully acknowledge the contribution offered by Dr. R. Arun Kumar, Associate Professor of Pharmacology, Dr. Shobita Devi, Veterinary Medical Officer, Central Animal House and Dr. S. Govindaraju, Statistician, Chettinad Hospitals and Research Institute, Kelambakkam, Chennai, India. Abdelgadirand, E.H. and S.E.I. Adam, 2011. Effect of various Levels of dietary malathion on wistar rats. J. Pharmacol. Toxicol., 6: 69-75. Abdollahi, M., M. Donyavi, S. Pournourmohammadi and M. Saadat, 2004. Hyperglycemia associated with increased hepatic glycogen phosphorylase and phosphoenolpyruvate carboxykinase in rats following subchronic exposure to malathion. Comp. Biochem. Physiol. Part C, 137: 343-347. Aebi, H., 1984. Catalase in vitro. Meth. Enzymol., 105: 121-126. Beard, J., T. Sladden, G. Morgan, G. Berry, L. Brooks and A. McMichael, 2003. Health impacts of pesticide exposure in a cohort of outdoor workers. Environ. Health Perspect., 111: 724-730. Begum, G. and S. Vijayaraghavan, 1999. Effect of acute exposure of the organophosphate insecticide Rogor on some biochemical aspects of Clarias batrachus (Linnaeus). Environ. Res., 80: 80-83. Binukumar, B.K. and K.D. Gill, 2011. Chronic Exposure to Pesticides- Neurological, Neurobehavioral and Molecular Targets of Neurotoxicity. In: Pesticides in the Modern World - Effects of Pesticides Exposure, Stoytcheva, M. (Ed.). InTech., ISBN: 978-953-307-454-2, pp: 1-18. Carlberg, I. and B. Mannervik, 1975. Purification and characterization of the flavoenzyme glutathione reductase from rat liver. J. Biol. Chem., 250: 5475-5480. Datta, S., P. Dhar, A. Mukherjee and S. Ghosh, 2010. Influence of polyphenolic extracts from Enydra fluctuans on oxidative stress induced by acephate in rats. Food Chem. 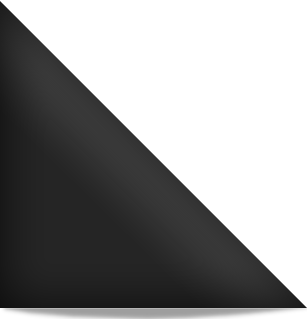 Toxicol., 48: 2766-2771. Durak, D., F.G. Uzun, S. Kalender, A. Ogutcu, M. Uzunhisarcikli and Y. Kalender, 2009. Malathion-induced oxidative stress in human erythrocytes and the protective effect of vitamins C and E in vitro. Environ. Toxicol., 24: 235-242. El-Demerdash, F.M., 2011. Lipid peroxidation, oxidative stress and acetylcholinesterase in rat brain exposed to organophosphate and pyrethroid insecticides. Food Chem. Toxicol., 49: 1346-1352. El-Kott, A.F. and M.M. Bin-Meferij, 2008. Influence of green tea on haematological and lung histological disorders induced by malathion in rats. Res. J. Environ. Toxicol., 2: 85-91. Flohe, L. and F. Otting, 1984. Dismutase Assays. In: Methods in Enzymology, Abelson, J.N. and M.I. Simon (Eds.). Vol. 105, Academic Press, New York, pp: 93-104. Franco, J.L., T. Posser, J.J. Mattos, R. Trevisan and P.S. Brocardo et al., 2009. Zinc reverses malathion-induced impairment in antioxidant defenses. Toxicol. Lett., 187: 137-143. Fulia, A., P.K. Chauhan and R.K. Sharma, 2011. Ameliorating effect of vitamin E on testicular toxicity induced by endosulphan in Capra hircus in vitro. J. Pharmacol. Toxicol., 6: 133-140. Hectors, T.L., C. Vanparys, K. van der Ven, G.A. Martens and P.G. Jorens, 2011. Environmental pollutants and type 2 diabetes: A review of mechanisms that can disrupt beta cell function. Diabetologia, 54: 1273-1290. Joshi, A.K. and P.S. Rajini, 2009. Reversible hyperglycemia in rats following acute exposure to acephate and organophosphorus insecticide: Role of gluconeogenesis. Toxicology, 257: 40-45. Kamath, V. and P.S. Rajini, 2007. Altered glucose homeostasis and oxidative impairment in pancreas of rats subjected to dimethoate intoxication. Toxicology, 231: 137-146. Kiely, T., D. Donaldson and A. Grube, 2004. Pesticides industry sales and usage 2000 and 2001 market estimates. Biological and Economic Analysis Division, U.S. Environmental Protection Agency, Office of Pesticide Programs, Washington, DC., USA. Koc, N.D., F.E. Kayhan, C. Sesal and M.N. Muslu, 2009. Dose-dependent effects of endosulfan and malathion on adult wistar albino rat ovaries. Pak. J. Biol. Sci., 12: 498-503. Lasram, M.M., A.B. Annabi, N. El Elj, S. Selmi, A. Kamoun, S. El-Fazaa and N. Gharbi, 2009. Metabolic disorders of acute exposure to malathion in adult wistar rats. J. Hazard. Mater., 163: 1052-1055. Pournourmohammadi, S., B. Farzami, S.N. Ostad, E. Azizi and M. Abdollahi, 2005. Effects of malathion subchronic exposure on rat skeletal muscle glucose metabolism. Environ. Toxicol. Pharmacol., 19: 191-196. Rahimi, R. and M. Abdollahi, 2007. A review on the mechanisms involved in hyperglycemia induced by organophosphorus pesticides. Pestic. Biochem. Physiol., 88: 115-121. Ranjbar, A., M.H. Ghahremani, M. Sharifzadeh, A. Golestani, M. Ghazi-Khansari, M. Baeeri and M. Abdollahi, 2010. Protection by pentoxifylline of malathion-induced toxic stress and mitochondrial damage in rat brain. Hum. Exp. Toxicol., 29: 851-864. Rezg, R., B. Mornagui, A. Kamoun, S. El-Fazaa and N. Gharbi, 2007. Effect of subchronic exposure to malathion on metabolic parameters in the rat. C. R. Biol., 330: 143-147. Rezg, R., B. Mornagui, M. Benahmed, S.G. Chouchane and N. Belhajhmida et al., 2010. Malathion exposure modulates hypothalamic gene expression and induces dyslipedemia in Wistar rats. Food Chem. Toxicol., 48: 1473-1477. Rezg, R., B. Mornagui, M. El-Arbi, A. Kamoun, S. El-Fazaa and N. Gharbi, 2006. Effect of subchronic exposure to malathion on glycogen phosphorylase and hexokinase activities in rat liver using native PAGE. Toxicology, 223: 9-14. Rotruck, J.T., A.L. Pope, H.E. Ganther, A.B. Swanson, D.G. Hafeman and W.G. Hoekstra, 1973. Selenium: Biochemical role as a component of glutathione peroxidase. Science, 179: 588-590. Sadeghi-Hashjin, G., M. Moslemi and S. Javadi, 2008. The effect of organophosphate pesticides on the blood glucose levels in the mouse. Pak. J. Biol. Sci., 11: 1290-1292. Shadnia, S., S. Ashrafivand, S. Mostafalou and M. Abdollahi, 2011. N-acetylcysteine a novel treatment for acute human organophosphate poisoning. Int. J. Pharmacol., 7: 732-735. Tos-Luty, S., D. Obuchowska-Przebirowska, J. Latuszynska, M. Tokarska-Rodak and A. Haratym-Maj, 2003. Dermal and oral toxicity of Malathion in rats. Ann. Agric. Environ. Med., 10: 101-106.